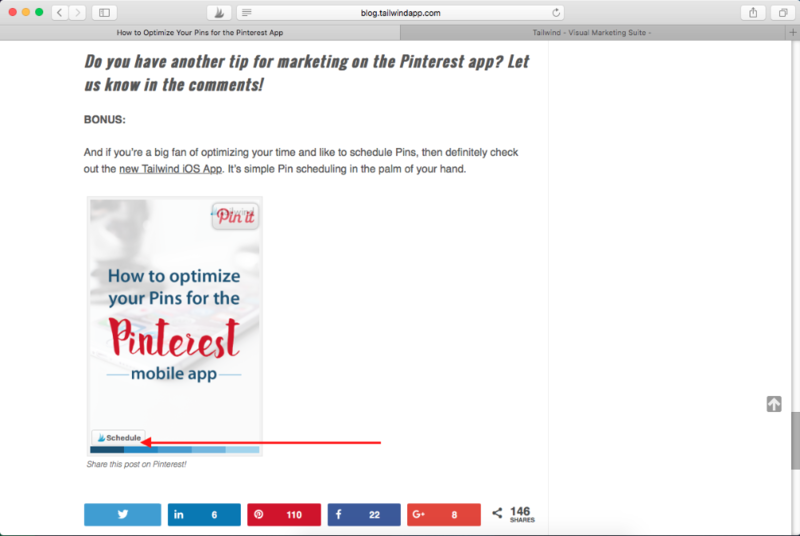 How do I use the Tailwind Extension to schedule Pins to Pinterest? Pin more often and more quickly! 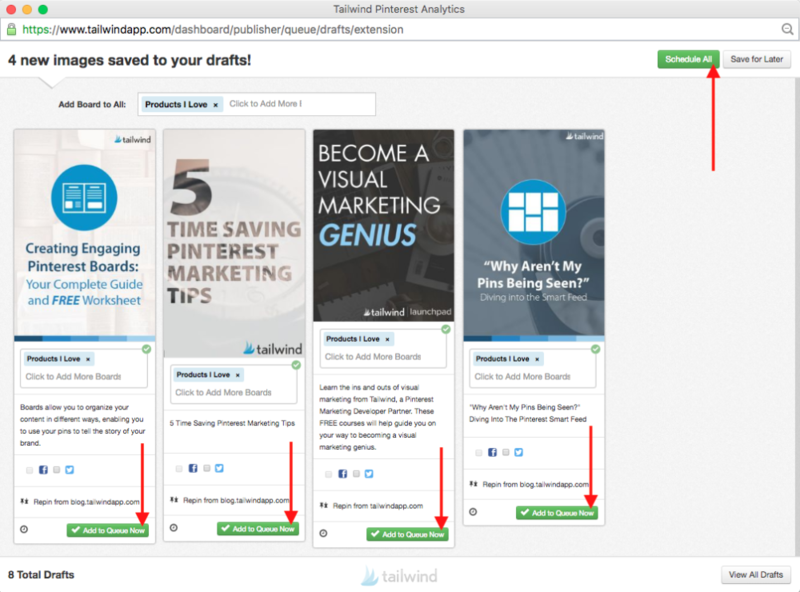 See how to use Tailwind's Publishing extension to schedule and publish content to Pinterest. 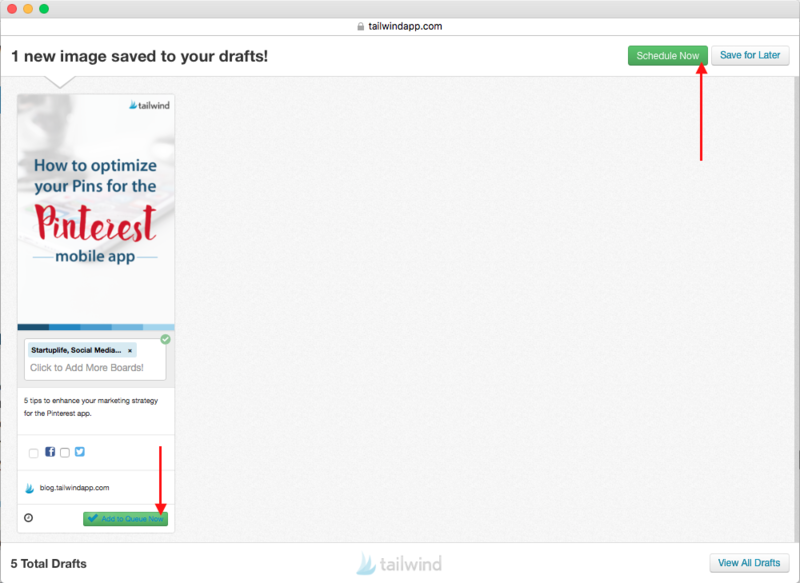 Tailwind Publishing Extension makes it easy to schedule and publish content to Pinterest. 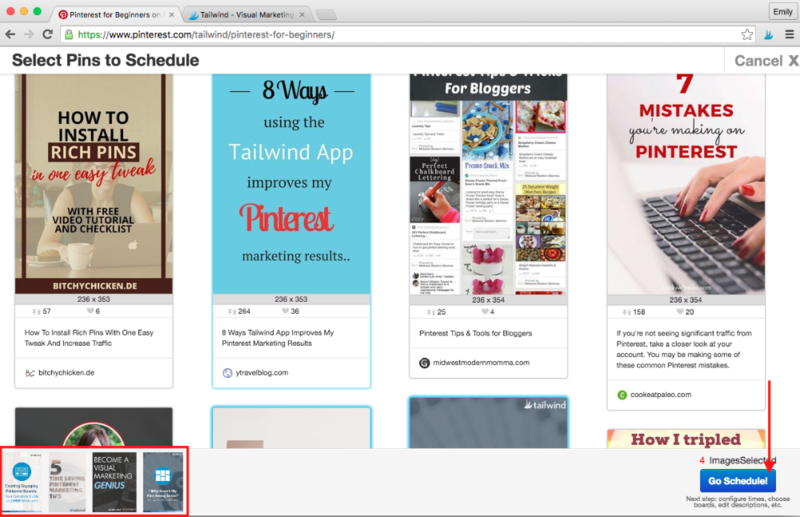 Below we'll show you how to schedule Pins with the Tailwind extension from Pinterest, a blog, and an online store! Each example is shown in a different browser, but you can repeat any of these in any of the supported browsers! Here is an in-depth tutorial video of how to use Tailwind's Publishing Extension in Chrome. 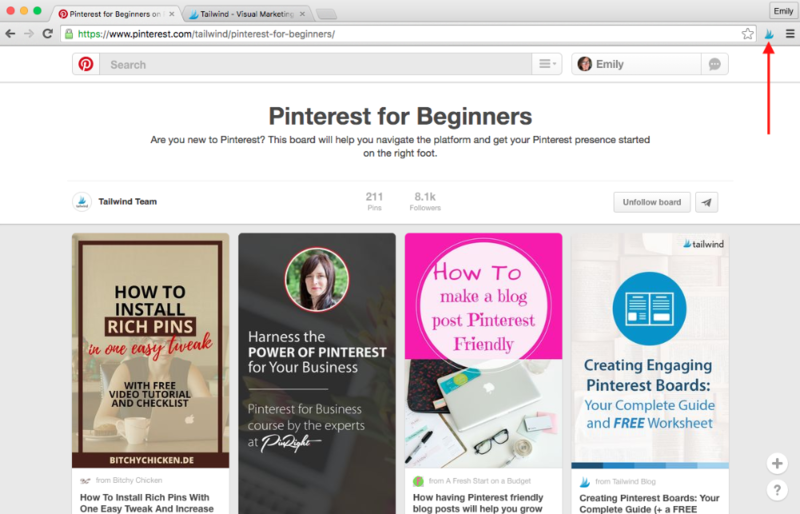 Our favorite place to find great content is directly on Pinterest! With Tailwind's Publishing Browser Bookmarklet it is easy to quickly select and schedule many pins at once. 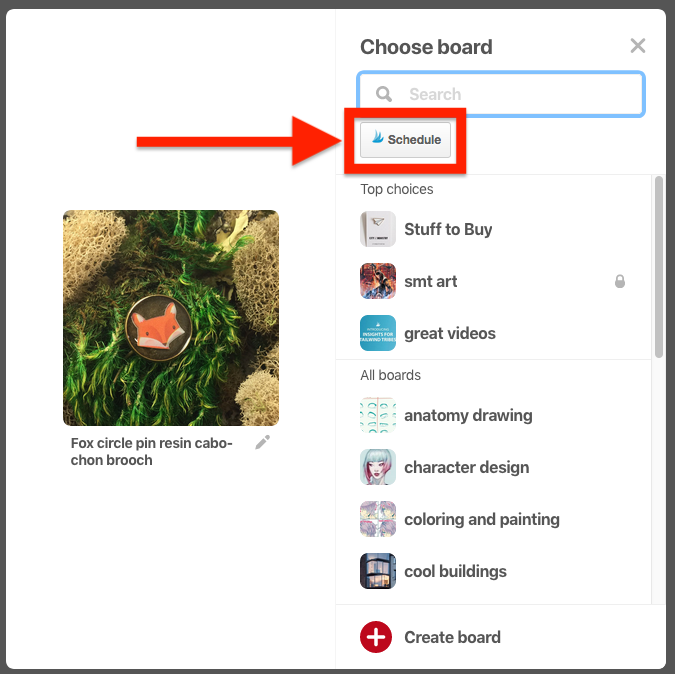 You can use Chrome, Firefox, or Safari to schedule and publish content to Pinterest. Tailwind does not support Internet Explorer, Opera, or Edge browsers. This example is shown in the Google Chrome Browser, but remember you can repeat this in any supported browser. Once you've found some pins on Pinterest to schedule, click the Tailwind Browser Bookmarklet (In Chrome, it is located in the top right corner). 2. Click to select the pins to be scheduled. The bottom of the page will display a thumbnail of the selected pins, and click "Go Schedule" button to move on to the next steps of adding board(s) and description. 3. Once here, you can assign boards and edit any Pin descriptions to your selected Pins. Once you are happy with how your Pins look, click the "Schedule All" button to schedule all the pins shown at once or "Add to Queue Now" on individual pins to schedule one at a time. Click the "Save for Later" button to save these pins as Drafts to be scheduled later. Helpful Tip: If you wanted to add an Interval, this would be the place to do it! The next best place to find and schedule content is from a blog or just about any other website! It could be your own blog, or even a fellow pinner's blog- whatever you choose Tailwind will be ready to help you quickly curate content. This example is shown in the Apple Safari Browser, but remember you can repeat this in any supported browser. When you find a blog post that you'd like to schedule, you'll want to make sure that you click into the blog post so we can grab the correct, and full URL, and not just the blog's homepage. Hover over the lower left hand corner of the image to find the Tailwind Publishing Extension. Click the "Schedule" button to move on to the next steps of adding board(s) and description. 2. Once satisfied with what board(s) and the description the pin will be scheduled and published to, click "Schedule Now" or "Add to Queue Now" to schedule. Click the "Save for Later" button to save these pins as Drafts to be scheduled later. If you own an online store, like Etsy, Ebay, Shopify, TeacherPayTeachers (just to name a few), you already know the powerful and free sharing tool that Pinterest has to offer. This example is shown in the Mozilla Firefox Browser, but remember you can repeat this in any supported browser. When you find the perfect product that you'd like to schedule, you'll want to make sure that you click into the product description page so we can grab the correct and full URL and not just the store's homepage. This etsy store has a very unique background and clear image that would be perfect to use for Pinterest! The Tailwind Browser Bookmarklet will work on this page, but for this example click the Pinterest "Save" button located below the product's details. 2. A new pop-up window will open and the Tailwind Publishing Extension will be just to the right of the Search Boards box. Click the "Schedule" button to move on to the next steps of adding board(s) and description. 3. Once satisfied with what board(s) and the description, the pin will be scheduled and published as click Schedule Now or Add to Queue Now to schedule. Click the "Save for Later" button to save these pins as Drafts to be scheduled later. Scheduling your products can definitely give you an extra boost of business! 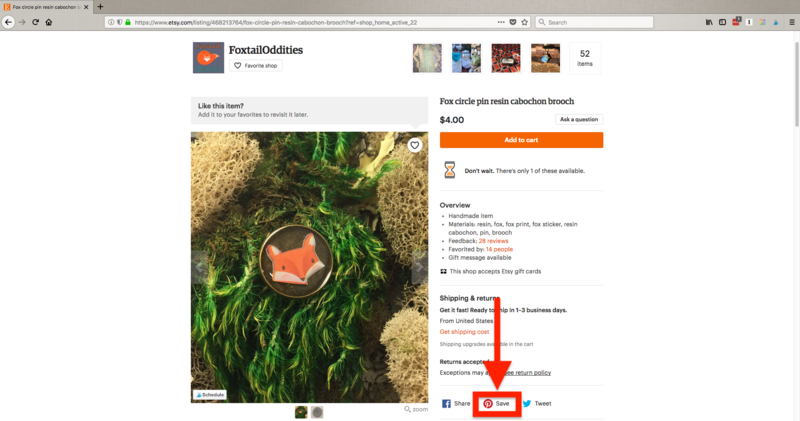 Learn interesting marketing strategies for online stores from the Tailwind Blog: Etsy Marketing on Pinterest.